I thought of writing about a few subjects that I am faced with and have to deal with. The most important subject is that of lifestyle change. Gearing up to do what I am going to do, certainly will demand a change in lifestyle. I have been in the same life routine since 2004. Of course my life routine has pointed to leaving in November, although a lifestyle routine is a routine. Due to this, there will be an adjustment period, into, not the most common type of lifestyle. Considering that there is an adjustment period, I have decided to finish working on October fifteenth. This will give me just about a whole month before I get to my starting destination. The tentative plan right now, will be to enjoy some hosteling on the coast here in California. On October twenty fifth I am going to Minneapolis-home town- until the twenty ninth. The night of the twenty ninth I am going to drive to Sacramento and stay at the hostel there. Then maybe go to Nevada until the first of November. From the first until the eighth of November I will be at Sierra Hot Springs which I have had this planed from the very start. On the ninth I will sell my truck and hang out somewhere until the eleventh. Any type of situation in life, a person can get use to, in due time. Sleeping in my own room at home with white noise running, is a big difference, then sleeping in the same room with four or more other people. Considering this, patience, putting up with being inconvenienced-the quality of long suffering-getting use to the noise, and getting away from what is comfortable will prove to be a period of adjustment and lifestyle change. Accepting a type of “nomad” lifestyle, living out of a backpack, will help in the adjustment period. The way to go would be to buy a mule. The problem with that is, no place to park him at the hostels. A mule could carry everything, including myself. I realize the implications of emotion that a person can be faced with on an initial basis. Any type of feeling of being overwhelmed, can create easily, within a large foreign city on the arrival. A person’s power to troubleshoot can seriously be reduced by being overwhelmed with emotion. Waiting is the key. Find a bench, sit down, and wait. Check out the surroundings and let the emotion cool down. It’s not like I will be in a hurry. I have all the time in the world. Observing this when I drove airport sedan and limo, and experiencing this in the past, has taught that the emotion of “non-thinking” can effect anyone at anytime. The above photos are from the Hyde street pier in San Francisco. The charge was only five dollars to tour three of the boats. The top photo is a full rigged sailboat. 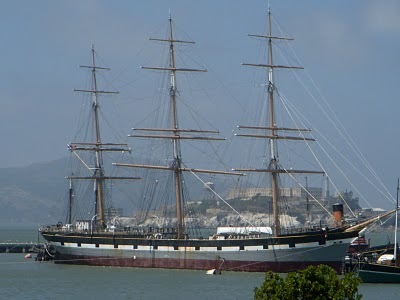 The Balclutha: 256 feet, built in Glasgow Scotland. These boats are the only thing I looked at up in the city. I really was not into the site-seeing mode. These boats were a great experience in itself. 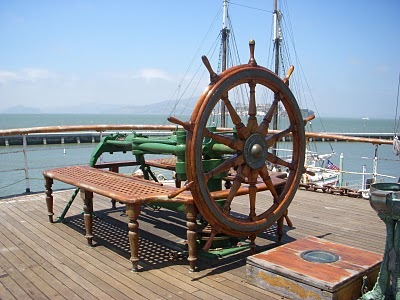 Within the self-tour they have many written plaques which gives information about the Captain’s quarters and what not. Many tourist just walk through, kind of humorous at times. Each boat also has videos which are about six to ten minutes long. I try to feel the energy of history within the tour and get the feeling of what they must have went through on these boats. 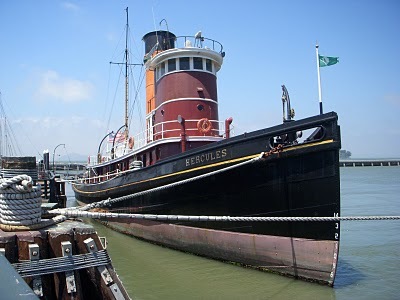 The tug boat, named Hercules, was powered by steam, 139 feet long. I found it extremely interesting. One thing is that the sailors must not have been all that tall, considering the small about of room they had to sleep in. Tough times before our modern age of electricity. Take electricity away and it’s a whole different way of life. Next post: A Pair of Shoes for a Pelican.